Bone broth here, bone broth there, bone broth everywhere. That's how I feel after this age-old health staple has come to the forefront in the last couple of years, but I'm not complaining. A good bone broth has wonderful benefits and traditionally takes quite a bit of time and effort to make, but now there are high-quality powdered packet versions - and even Costco sells them. 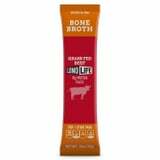 Some Costco locations are carrying Grass-Fed Beef Bone Broth Powder from LonoLife, a company that makes a variety of nutritious bone broth products. Each powder packet has 10 grams of protein and only seven clean ingredients: beef collagen, chicory root, beef, salt, yeast extract, natural flavors, and spices. That means it's dairy-free, gluten-free, Paleo, keto, and free of preservatives or added sugar. It checks all the boxes, and all you have to do is mix it with eight ounces of hot water before enjoying it during lunch at work or as post-workout fuel. It'd be especially convenient on a hike or while camping, don't you think? If you personally are all aboard the bone-broth train but don't always want to make a big batch, this could be the solution.